Dion Fortune (1891-1946) is a key light in the 20th century Western Mystery tradition and the founder of the Society of Inner Light. She was a prolific author, and her non-fiction works include Psychic Self-Defense and Practical Occultism, co-authored with Gareth Knight. Her fiction titles include the famous Moon Magic and The Sea Priestess, which are the sources of various Wiccan rituals that are still used today. Faced with the prospect of public, scientific, and medical skepticism, Fortune cleverly framed these curious cases in the detective story form used by Arthur Conan Doyle for his Sherlock Holmes mysteries, a fictional form quite familiar to and popular with the reading public. Dr. Rhodes is fascinated by Taverner and his unusual methods, and acts as a recorder of events much as Dr. Watson records Holmes’ case. Twelve case studies are presented in the book; by the end the reader will wish there were more. Taverner’s patients exhibit a range of problems including vampirism, curse-spells, karmic debt issues, and unwilling astral travel. Some fascinating cases focus on the difficulties faced by elemental creatures born into human forms. The “cures” the doctor effects are, to say the least, unconventional. It’s clear that Taverner’s intent is to match the remedy to the patient’s best interests, but sometimes this falls far outside the family’s hopes. In the curse cases, Taverner (himself a high adept) applies his own form of metaphysical justice simply because regular law enforcement and courts have no mechanisms for dealing with black magic. As he explains to Rhodes, “I would make the punishment fit the crime. Occult offences are always dealt with by occult means.” Dr. Taverner’s occult affiliations and practices are kept shrouded, but there are still some fine nuggets of occult lore contained in this book. 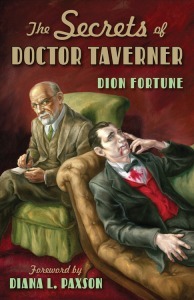 Although The Secrets of Doctor Taverner is eighty-five years old, this book, like the Sherlock Holmes mysteries, is still a fascinating book that contemporary readers will greatly enjoy. Highly recommended as an entertaining book of medical detective stories with a metaphysical spin.